SURPLUS MILITARY ARMY MENS SHIRT RAW VIN.. BRANDIT RAVEN WIRE SHIRT MENS COTTON FLA.. HELIKON MENS TACTICAL BASEBALL CAP VENT.. CONDOR TACTICAL BREATHABLE ADJUSTABLE CA..
M65 COMBAT FIELD JACKET MENS VINTAGE TYP.. HIGHLANDER CYPRESS 6 PERSON, 2 BEDROOM FESTIVAL TENT CAMPING HIKING. 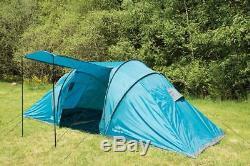 Ideal First Time Camping tent with 2 seperate bedrooms and spacious central living area. They are quick and easy to pitch. Easy outer pitch first vis a vis style. Low and high level vents. Large living area window with curtain. Seperate groundsheet for living area. Heavy duty expandable carry bag. · Outer fabric: 190T Breathable polyester with waterproof PU coating. · Inner fabric: 190T Breathable polyester. · Easy outer pitch first vis a vis style. · Low and high level vents. · Large living area window with curtain. · Separate groundsheet for living area. · Pre attached high visibility guylines. · Poles: 9.5mm & 11mm fibre glass. · Pitching time: 5 minutes. The goods that you order will be delivered to the address that you give when you place your order. In the unlikely event that there is to be a delay, we will contact you straight away to advise of this. Please be advised that you can always upgrade the service of dispatch when ordering. Genuine postal losses are rare in the UK. We want you our customer to have complete satisfaction every time that you shop with us. If you change your mind and want to return items, no problem! HOWLETTS FARM CANTERBURY KENT CT48HW. Or ring us with your order details including your Order No. Print off and attach the label to your return package. Take your package to your local Post Office to get your receipt and tracking details. Please make sure to include your Invoice Order No. Details in with your return. Please also note that we do not accept personal callers. MIL-TEC TEESAR CWU FLIGHT JACKET MILITAR.. MILITARY PERSONALISED ARMY DOG TAGS 26.. A2 LEATHER FUR COLLAR FLIGHT JACKET AIRF.. VIPER MINI MODULAR BACKPACK PACK HYDRATI.. VIPER MODULAR POUCH OPERATORS TACTICAL M..
VIPER SPECIAL OPS MOLLE BAG POUCH MILITA.. MAGNUM M-PACT 1 PAIR BOOT INSOLE SPORT.. MAGNUM MX-3 CREW SOCKS MENS BLACK IRON G.. SURPLUS XYLONTUM SUPREME MENS JACKET WAR.. EYE LEVEL ASSASIN POLYCARBONATE SPORT LE.. JACK PYKE FLEECE SHOOTERS MITTS GLOVES F.. SIESTA MEXICAN BAJA SIESTA FESTIVAL SURF.. Bl A1ebayer great price and quality many thanks. 98 Very happy with the product. J4 Good price and quality. Kr The item was outstanding. Will use again and would recommend. Get in touch with us. The item "HIGHLANDER CYPRESS 6 PERSON, 2 BEDROOM FESTIVAL TENT CAMPING HIKING" is in sale since Saturday, March 10, 2018. This item is in the category "Sporting Goods\Camping & Hiking\Tents & Canopies\Tents". The seller is "transatlantic-vintage-surplus" and is located in Canterbury. This item can be shipped worldwide.